Saw that on Yahoo yesterday, love Bibi. Good luck. They're actually kinda cute together. Almost Famous Pod Bibi on and said she is dating someone but it isn’t Peter. [You must be registered and logged in to see this link.] thanks for posting. I'll believe Peter is dating when I hear the words coming out of his mouth. I just can't see Peter with Bibi--I'd be very worried she'd get hurt by him. JMO. 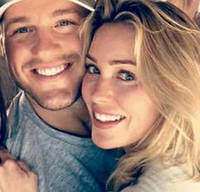 Julian, 31, and Kraus, 33, were spotted getting cozy at a Miami Heat game on December 4, sparking romance speculation. But the Bachelor in Paradise alum confirmed on the Monday, December 17, episode of the “Almost Famous” podcast that the pair’s relationship is strictly platonic. “Nothing is going on with Peter Kraus and I. Absolutely nothing,” Julian told cohosts Ashley Iaconetti and Ben Higgins. So he's a commitment-phobe and a freeloader? Rachel is so smart! This is her tweet: charity event” - you mean staying at my place for 4 days during the busiest week in Miami and leaving without saying good bye or thank you? Dean, you know nothing for a fact unless you were there with him for four days. this guy is so weird IMHO. He doesn't go on public dates, he prefers to say indoors for four days at someone's house. Where do you go on a dates if it's not public? Here's an update on the situation. And correct me if I'm wrong, but I interpreted that whatever went down with them, it sounds like it happened prior to his trip to Miami. And it goes in line with what she said on the podcast. I believe her tweets was only referring to him crashing and leaving.